Redevelopment Management Resources, Inc. is a 501©3 organization based and operating in the Austin neighborhood since 2012. Redevelopment Management Resources seeks to develop and implement systems, services and programs to revitalize distressed neighborhoods through the facilitation of the delivery of resources and services. We aspire to inspire transformation in the areas in which we invest our efforts. We view each project as an investment in the lives of the people and the future of the community. It is with great pleasure that we submit our vision for the development of a successful and sustainable framework and resource for the arts, artists and art organizations in Austin. We seek to expand upon our work to enrich the cultural life and the community narrative of the Austin community. We offer leadership that contributes to a thriving Austin community. Art has the potential to create change in a community. Art , in its various forms, touches and moves people. 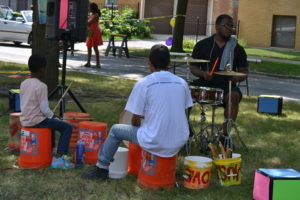 Development of assets and community support for cultural programming that fosters creative expression on the west side of Chicago, facilitating a flourishing arts community that contributes to a thriving community. Schedule of Events: Develop a season of theater events with emphasis on works developed by the community. Artist and Technical Development: Identify space for instruction led by teaching artists or other consultants. Program Content: Given a commitment to cultural and informational productions that tell the stories from our community, emphasis would be placed on sourcing and developing content that reflect the interests and needs of the community. A commitment of Catalyst Theater space would serve as the foundation for realization of our mission for performing arts in Austin. This space could facilitate collaborations with existing cultural organizations for presentation of their work. Given Austin’s current community narrative, many artists hesitate to participate in new and unproven art events. With the success of events in 2018, like the Awesome Austin Art Affair, the narrative around art in Austin is changing. By bringing art closer to people, the built environment can be used to engage and foster creativity. Engaging with art can connect people with their senses and this connection and feeling may help to move them to think and engage. Lobbies, offices and vacant storefront windows are just a few of the spaces that could be enlivened by locally produced art. Outside of buildings, parks, parking lots and community gardens are also well suited for art and cultural displays. There are many more possibilities in the Austin build environment. They would be identified and access could be secured. Major local institutions could conduct and sponsor a public competition for a permanent art installation for placement in prominent locations on their properties. This work could also be considered for use as part of their branding efforts. Internal and external spaces can be transformed by featuring the work of visual artists. Options exist beyond wall murals. One recurring annual exhibit could be the work of high school students who participate in the Congressional Art Competition. Students submit original, works for submission to a national competition. The works of local winners would be displayed. Art fairs provide multiple benefits. Chief among them is the opportunity for artists to earn income from their creative work. An art fair devoted to the work of all students in Austin, held outside of a particular school, would provide great visibility and encouragement. Certainly the students participating the Congressional Art Competition could be participants. Art instructors at each school could promote this event. 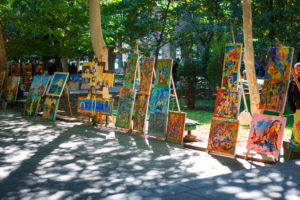 An art fair targeting all artists would provide an outlet for local artists. An event of this type could generate interest and energy from artists and art buyers outside of Austin. Programming evaluation would take place continually and at the conclusion of each event to gauge relevance as well as level of interest and. Quantifiable measures of success include audience size, revenues and student attendance levels participation. We can evaluate effectiveness through qualitative measures such as surveys, evaluation forms and direct feedback. We would use this information to ensure that the programs remain relevant. Engagement is a relevant outcome. A second relevant outcome is perceived improvement to quality of life. Redevelopment Management Resources, Inc. has completed and presented successful and award winning programming as a convener of collective impact initiatives in the Austin community. We propose to provide strategic initiative support to create programming and infrastructure that is critical in the creation of a flourishing arts community. We would welcome the opportunity to discuss this further.